Lapis Lazuli in Sekiro is a material used to upgrade some of your Prosthetic Tools. It can only be obtained much later in the game You can get it from specific vendor and some pretty well-hidden enemies. Here’s our Sekiro Lapis Lazuli guide to show you where you can find all Lapis Lazuli in the game and get that sweet Diamond Sword upgrade. We’ll also discuss some possible farming methods. Above all, getting Lapis Lazuli to upgrade your prosthetic is important for achieving Master of the Prosthetic Trophy. Before we plunge into the details, we’re gonna take a sec and put up a SPOILER WARNING right here. We’ll be discussing some very late-game stuff here. If you haven’t at the very least killed Genichiro, tread lightly from here on out. Lapis Lazuli Locations – How to Obtain this Upgrade Material in Sekiro? To get the Lapis Lazuli prosthetic tool upgrade material in Sekiro, one of your options is Pot Noble Koremori, who lives in Fountainhead Palace. You can find him, appropriately enough, next to the Sculptor’s Idol called Near Pot Noble. He will sell you two Lapis Lazuli; 6 Carp Scales for each. 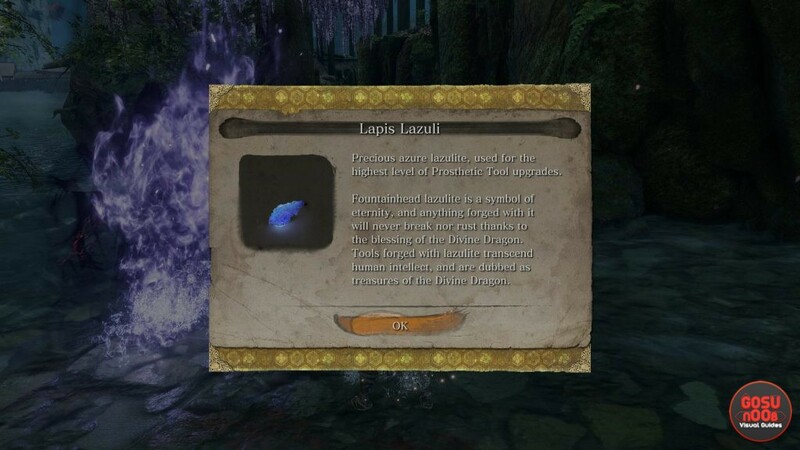 Also, after you solve the lengthy quest about the feud between Koremori and Pot Noble Harunaga (MORE SPOILERS), you’ll find a Lapis Lazuli next to the one you’ve turned into a fish. For more details on these two weirdos, check out our Sekiro Pot Noble Merchants – Fountainhead Palace & Hirata Estate guide. Also in the Fountainhead Palace area, there’s a Shichimen Warrior mini boss that you can kill. Upon his demise he will grant you Lapis Lazuli. The Shichimen warrior is behind the tall waterfall on the right, behind the small tower that a tree is growing through. Before the three dogs, climb onto the ledge on the right. Go under the pillars, hop into the stream, and turn left. That’s where the Shichimen Warrior is waiting for you. Two more Lapis Lazuli drop from the Demon of Hatred, an optional end-game boss that you can battle. It only becomes available if (ANOTHER SPOILER WARNING) you decide to disobey the Iron Code and stay to protect Kuro. You can check out our youtube video showing all of the locations discussed here. We found 6 upgrade materials in a single playthrough. You need 10 to upgrade all prosthetic tools. Consequently, you’ll have to play New Game Plus in order to get all the lapis that you need. This is why the method for farming Lapis Lazuli is important. There is reports that killing Kuraokami Warriors, found in Fountainhead Palace, has a small chance of dropping lapis. These are pretty much any enemy in the area. To increase your drop chance use the Demon Bell buff. Above all you should use Mibu Possession Balloon for increased item drop chance. Also, upgrade your monk skills that increase drop chance. Even with buffs the drop rate is abysmal. What is the diamond sword upgrade? And how to get it? I pretty sure that there is no such thing as a “Diamond Sword Upgrade”, he was probably making a reference to minecraft. I know very little about minecraft but I think you use lapis to enchant weapons in it.